I stopped trying to force myself to work. I was just staring at my computer screen doing nothing, so I decided to give up and do something else. First, I went for a short walk to check out mail, just to get out of the house. 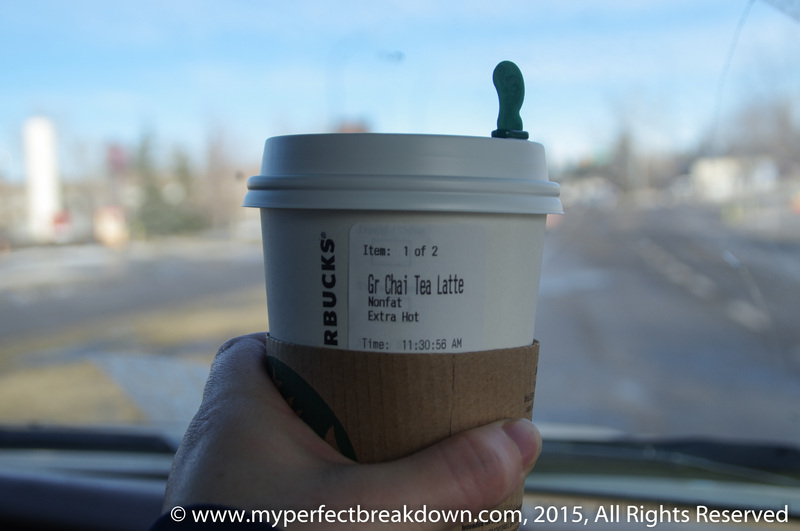 Then, I went for a mid-morning Starbucks treat – extra hot, non-fat chai latte. While in line at the drive through I purchased the lunch/coffee for the individual behind me. Hopefully I was able to spread some joy and make someone else smile. I watched Humble and Kind by Tim McGraw, which attempted to restore my faith in human kind. But, somehow YouTube used this video to take me on a trip down memory lane as Tim McGraw videos some-how turned into a run of County music videos from the 1990s, which somehow turned into a few of my sister’s favourite songs, including her absolute favourite song – Strawberry Wine by Deana Carter. I had an unbelievably therapeutic cry for all that my heart misses and longs for. When the tears stopped flowing, I decided it was time for a mid-day run. I have not run in months thanks to my stomach issues. In fact, I feel as though I have not done much exercise since my old spin studio was horrible to me. Needless to say, my 30 minute run consisted of more walking then I’d like to admit. It was hard. Incredibly hard. But, it also felt oh so good! 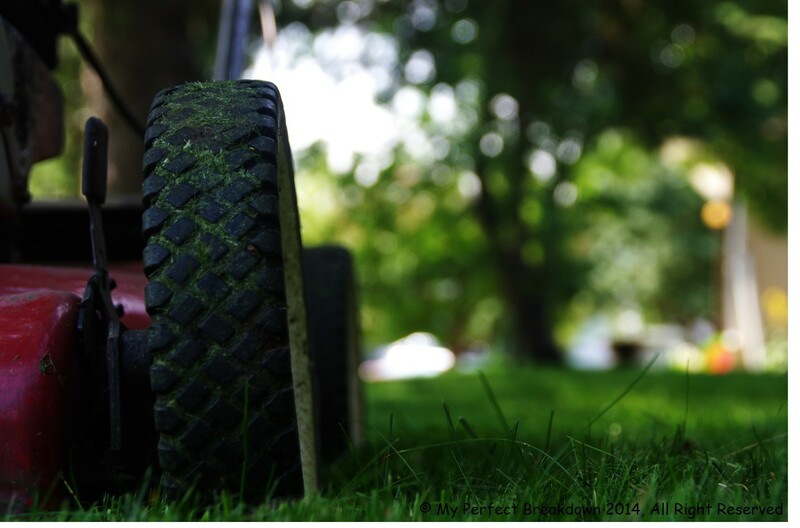 Then, I mowed the lawn, because combining physical work and necessary work just made sense. After that, Mr. MPB played with Little MPB while I did a few more things I just wanted to do. So after reading stories with Little MPB, I made Little MPB’s dinner, rice-crispy squares and cherry muffins (evidently I’m going to have to keep running to burn those calories) and then I sat down to write just for the sake of writing. And once Little MPB was sound asleep we began digging holes for new trees which are arriving next week (I’m not going to be able to lift my arms tomorrow). And while I thought I’d end the day with a glass of wine, instead I ended the day with a glass of water and Tylenol to help ease all my new found aches and pains. And you know what? It took me an entire day of doing all kinds of things to somewhat lift my spirits. Evidently curing my grouchiness takes a lot of effort! I’ll admit, I’m still a bit grouchy, but I really do hope that I’m on my way to feeling better. And once again (as it seems I say this every few months), I am reminded that I need to run or cycle. I need some sort of physical exercise in my life to keep me feeling sane (and allow me to eat sweet treats). I need to remember to take time for self-care. I listened to strawberry wine on repeat for months when it first came out. What a beautiful song! I often find that doing physical work eases my mental stress. Good for you for getting into activities to release some of the grouchy and stress. Oh this takes me back 🙂 I sang this for my 2nd grade talent show. Could you even imagine a school letting a second grader (or anyone for that matter) sing a song about wine these days?? Especially when the song is about underage drinking and losing your innocence. LOL. But seriously. Great song. GREAT album too! Glad your activities helped you feel better. Oddly enough, I was in a no good mood yesterday too (though I am pretty sure I know why) and I ended up giving a homeless guy money on the way home, and it did help. I totally get this. When I find myself in a grouchy rut, unable to be productive with brain-work, I just need to take a day to treat myself and get outside and do things that actually feel productive. Good for you for treating yourself when you really needed it ☺️ Sounds like a great day. I’m glad you did some things that you wanted to do. If i didn’t exercise every day I’d be a different person. Even as exhausted as I am sometimes I get up before the kids and run or cycle or lift weights. The endorphins always overpower my exhaustion and I feel like a new person. I can be better mom if I exercise in the AM. I hope you continue to be on the up and up! Wow I loved that song. Really brings me back. You’ve been thought so much and I just cannot even imagine. You are in my thoughts. Thanks my friend. It really is a great song!